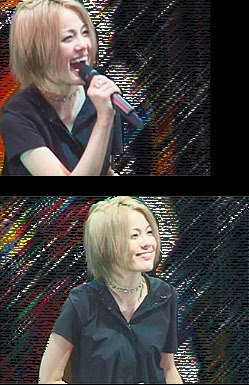 aikawa nanase was my first try on jrock back in 1997. discovered by her first producer oda tetsuro and after 5 years of training, she debuted in 1995 with don't want to be a dreaming girl. her debut album Red was a mega hit, and her career reached the climax with singles love heart and sweet emotion. in 2000, tomoyasu hotei, the ex-BOOWY and the great japanese guitarist, was introduced as nanase's new producer, hoping that would bring some new elements to nanase's music. oda continued to work with nanase as her executive producer. hotei's production did not last long, and recording and live production were in a pause in early 2001 due to nanase's pregnancy. after giving birth to her first son on 2001.9.6, she is now back with recording and live events. oda continued to be her executive producers, while okano hajime seems to be her primary producer at the moment. her songs used to be mostly speedy pop/rock, but we have been seeing a lot of ballad/slow tempo songs since her comeback after giving birth. beside music, nanase is also an expert in color thearpy. according to some unconfirmed source of information, nanase's next single will be released on 12.8. nanase revealed in her official website that recording was in progress, and the new single would probably include a song written by her (both melody and lyrics).